IN PRODUCTION – Stripped for Parts: American Journalism at the Crossroads reveals the critical fight newspaper men and women nationwide are waging to continue reporting the news, as growing threats push local journalism, the lifeblood of democracy, toward extinction. MIND/GAME: The Unquiet Journey of Chamique Holdsclaw tells the compelling story of basketball phenom Holdsclaw, from her rise to WNBA stardom where she was touted as the “female Michael Jordan” to her struggle with mental illness and the strength she called on to speak out about it. Winner, Voice Award, Substance Abuse and Mental Health Service Administration (SAMHSA). tells the tale of Daniel Ellsberg, a high-level Pentagon official who leaked 7,000 pages of top secret documents to The New York Times in 1971 in an attempt to end to the War in Vietnam. Winner, Peabody Award; Academy-Award nominee, Best Documentary Feature. recounts the remarkable 80-year career of newspaperman Seldes, and is a piercing look at censorship and suppression in America’s news media throughout the Twentieth Century. Academy-Award nominee, Best Documentary Feature. Everyday Heroes, a real-life look at youth, race and national service, takes a behind-the-headlines look at a diverse group of young adults who give a year of their lives through a San Francisco area AmeriCorps program to tutor and mentor needy kids. Anatomy of a Mural is Rick Goldsmith’s very first production. 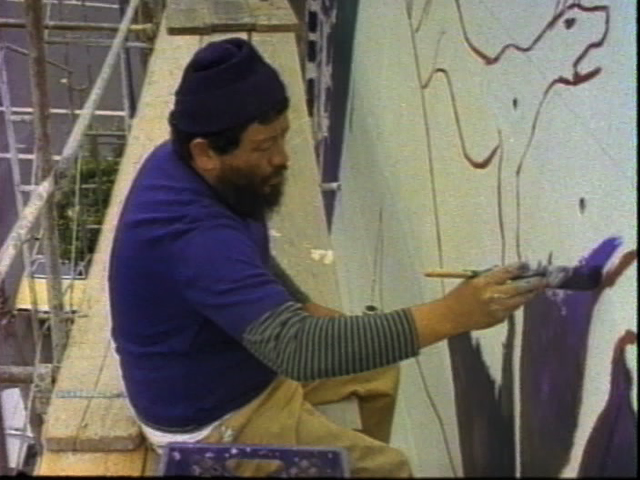 Shot on 16mm film, this 15-minute piece explores the creation of the mural adorning the Mission Cultural Center for Latino Arts in San Francisco, a project led by artist Carlos Loarca.